NASHVILLE, Tenn. – There was never any doubt in John Pierce’s mind regarding his future after his basketball career ended. Following a record-setting collegiate career at Lipscomb and five seasons of playing professionally overseas, Pierce returned to Nashville to do what he had always dreamed of: coaching basketball. “All along, I knew I wanted to be a teacher and a coach,” said Pierce, a standout from 1990-94 under legendary Bison coach Don Meyer. Pierce amassed 4,230 career points with the Purple and Gold, which still stands as the all-time record in college basketball. The Nashville native has spent the last 14 years as head coach at nearby Franklin Road Academy, and he was also elected to the Tennessee Sports Hall of Fame in 2015. Almost 25 years later, Pierce’s impact on the Lipscomb basketball program is still felt in many ways. 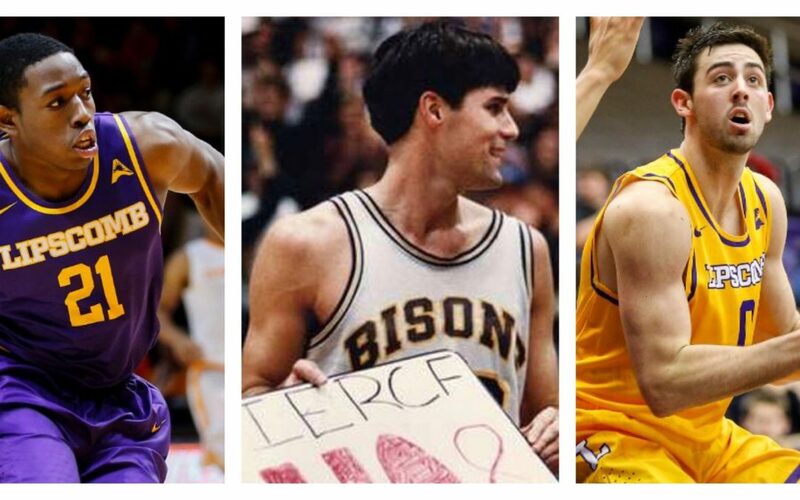 In addition to the memorabilia that fills trophy cases in the lobby of Allen Arena, two of Pierce’s former FRA players — Kenny Cooper and Rob Marberry — are now budding stars for the Bisons, despite taking different paths to Green Hills. Marberry earned Division II-AA Mr. Basketball honors as a senior at FRA in 2014 and finished his high-school career with over 1,500 points and 850 rebounds. Two years later, Cooper wrapped up an impressive career with the Panthers, finishing as a Mr. Basketball finalist and taking his team to consecutive Division II-AA state championship games. He committed to Lipscomb in August of 2015 and signed with the university later that fall. Marberry’s first stop came at Western Kentucky, where he played in 12 contests and averaged just 6.3 minutes per game during the 2014-15 season. He then chose to return to Nashville in hopes of playing a bigger role at Lipscomb. Pierce made it clear that while he endorsed Lipscomb to both Cooper and Marberry, the ultimate choice was left up to them. The decision has paid off for both athletes so far. Marberry sat out the 2015-16 season due to NCAA transfer rules and then burst on to the scene as a redshirt sophomore last year, just when Cooper emerged as a productive freshman point guard. Marberry played in all 33 games and averaged 12.7 points, and he also led the team in blocks with 30. His presence as an athletic post proved to be invaluable for a Lipscomb squad that was loaded with shooters but lacked interior depth. Meanwhile, Cooper played extensive minutes and contributed nearly seven points per game while dishing out 99 total assists. He also meshed well with the Lipscomb culture and noted the similarities between his former coach and his current one. Pierce had high praise for both players and said he isn’t surprised by their success at his alma mater. He reminisced on the days when Marberry “looked like a baby giraffe running around on the court” and of watching a 6-year-old Cooper “electrify” FRA basketball camps. Cooper’s background with Pierce led to a high level of trust between player and coach. That paid dividends on the court as the Panthers went 25-8 during Cooper’s senior season and fell just short of winning a state title. While Pierce gears up for another season at the helm of FRA, Cooper and Marberry will look to help the Bisons take their next step. Lipscomb went 20-13 last season and fell just short of making the ASUN Championship game. When he gets a break from coaching the Panthers, Pierce will surely be in the stands to watch Cooper and Marberry throughout the season – keeping alive a connection between Lipscomb teams of past and present.